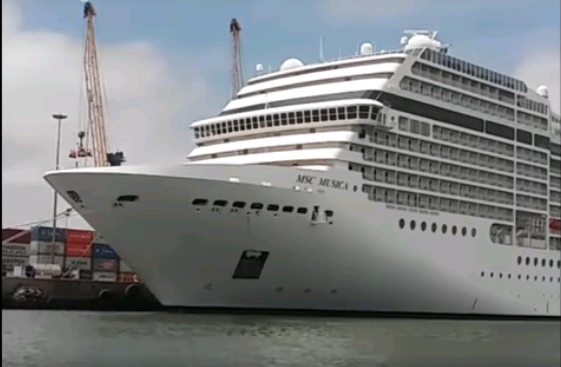 The arrival of the cruise liner MSC Musica in the port of Walvis Bay for a second time means that almost 10 000 tourists have disembarked and visited the harbour town and Swakopmund in less than a week. History was made about a week ago when four giant cruise liners docked at the Walvis Bay harbour and 7 000 visitors stepped on land to do sightseeing trips in and around the main coastal towns. 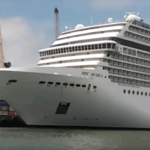 The second visit of the MSC Musica six days later brought the number of visitors close to 10 000. Last Wednesday the MSC Musica, the Nautica and the Queen Elizabeth arrived in the port. The simultaneous arrival of the three vessels in the Walvis Bay harbour was preceded by the arrival of another passenger liner, the Aida Auro the day before. Another historical first for the port was the arrival of the Queen Elizabeth. It is the first time this gentle giant lady of the seas moored at the docks. Her sister ship from the Cunard shipping line, the Queen Mary visited Walvis Bay before. The four giant vessels took up all the berth space along the quay and dwarfed Walvis Bay on the land side. Apart from the four new ship-to-shore cranes standing on the new container terminal quay the four ships were the highest structures in the port town for a period of 24 hours. Cruise liners from all over the world normally visit Walvis Bay from late spring until late summer. The MSC Musica is the first Musica-class cruise ship built in 2006 and is operated by MSC Cruises. The vessel has 12 decks with 1 268 passenger cabins which can accommodate up to 2 550 passengers in double occupancy format. Passengers are served by approximately 990 crew members. MSC Musica’s itineraries cover Mediterranean ports and Atlantic Ocean ports on both the African and American continents. The vessels operate in the northern hemisphere when it summer there and returns to Southern Atlantic when it is spring in the southern hemisphere in what is known in Walvis Bay as the cruise liner season.